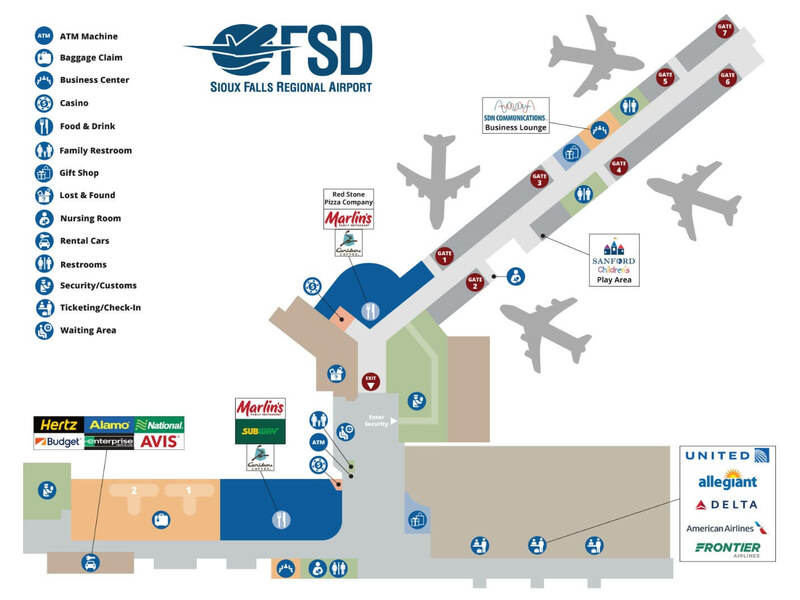 The Sioux Falls Regional Airport serves all aircraft operations from a single passenger terminal which was recently completely renovated and modernized. After those renovations, all luggage screening was moved from lobby to behind-the-scene terminal, and streaming check-in process time was reduced as well. More ticket counter check-in space was added to the one existing before, self-service check-in kiosks, a new business lounge, and gift shop were constructed for the attention of the passengers. The ticket wing was expanded due to the rising number of airlines operating in the airport. New Gates 1 & 2 and 3 & 7 were added to those existing as well. Food and drink services are available at SkyDine and Wildcat Corner. There is no Duty-Free available on the territory of the airport; however, souvenirs, merchandise, and some clothing items are available in the FSD Gift Shop.